by Eugen Rosenstock-Huessy. Scientia Verlag Aalen 1969. 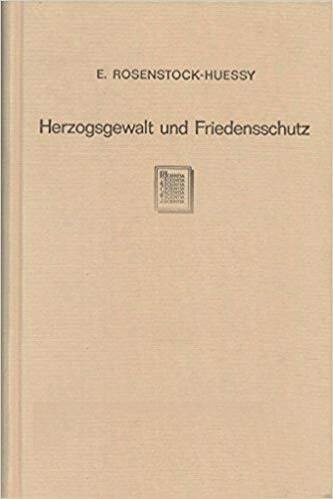 A facsimile reprint of the 1910 first edition, Herzogsgewalt und Friedensschutz (Princely Power and Peacekeeping) is an expanded version of Rosenstock-Huessy’s dissertation (Landesfriedensgerichte und Provinzialversammlungen vom neunten bis zwölften Jahrhundert (Local Courts and Regional Parliaments from the Ninth to the Twelfth Century), Heidelberg, 1909). Much of the matrix of modern European civilization was forged during the years covered in the title; Rosenstock-Huessy elucidates the development of both peace-keeping and legal process in the western regions of the Holy Roman Empire, exploring the traces of that formative process in the surviving written sources and evaluating the historical impact of those documents at the time of their composition.